In tiny apartments most of the space is taken over by bulky beds, we cannot do without. However, here is a wonderful solution, in the shape of a jigsaw-puzzle bed, which transforms into a bookcase when not in use. 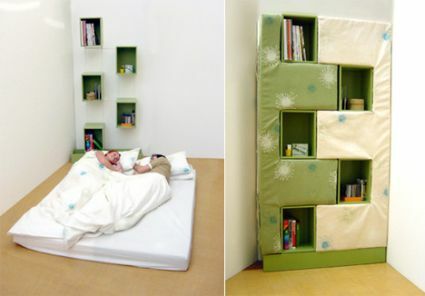 Work of designer Karen Babel, the bed comes in the shape of a mattress that stands straight in four pieces to form the bookcase. The mattress fits into the wall-mounted frame, containing five shelves. When you retire to bed, all you have to do is place the sections of the mattress on the floor and fix them in, to form your funky bed. You need to slot in two parts to make a single bed, whereas all four, in case you require a double one! My only concern is how it will feel to lie on a bed with a somewhat uneven surface. Meanwhile, what comes as a treat is the color the bed adds to the otherwise plain wall! How can you eat these babies!